BERGLAND, Robert Selmer, a Representative from Minnesota; born in Roseau, Roseau County, Minn., July 22, 1928; attended the Roseau public schools; University of Minnesota School of Agriculture, St. Paul, Minn., 1948; farmer; chairman, Minnesota Agriculture Stabilization and Conservation Service, March 1961-January 1963; midwest director, U.S. Department of Agriculture, January 1963-May 1968; unsuccessful candidate for election to the Ninety-first Congress in 1968; elected as a Democrat to the Ninety-second and to the three succeeding Congresses, until his resignation on January 22, 1977, (January 3, 1971-January 22, 1977); Secretary of Agriculture, 1977-1981; president, Farmland World Trade, March 1981-September 1982; vice president and general manager, National Rural Electric Cooperatives Association, Washington, D.C., 1982-1993; died on December 9, 2018 in Roseau, Minn. Oral History: 1982, 635 leaves. An oral history interview of Robert Bergland conducted in 1982 by Ed Edwin. In the interview, Robert Bergland discussed his congressional tenure, 1970-77; the creation of the Commodities Futures Trading Commission, Soviet grain sales, Organization of Petroleum Exporting Countries and the oil embargo, National Aeronautics and Space Administration, surplus dumping programs; Secretary of Agriculture, 1977-81; intelligence gathering, Food Stamp program, Farmer-owned Grain Reserve Program, budgeting procedures, soil erosion control, American Agricultural Movement, 1978-79, Food for Peace Program (Public Law 480), embargo on Soviet grain sales, 1979-80, issuance of nutritional guidelines, school lunch program, pest and predator control, loan and insurance programs; Presidential campaign, 1980; Equal Opportunity; views on: farm income and price support plans, crop subsidies, large vs family farms, farm workers, market orders, foreign and minority farm ownership, the Green Revolution, foreign agriculture, organic farming; impressions of Jimmy Carter, other officials. Papers: 1971-1983, 108.5 cubic feet. 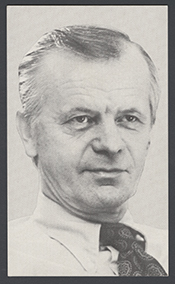 Political and personal papers of Bob Bergland, a DFL representative to the U.S. Congress for Minnesota's 7th District from 1971 to 1977, when he became Secretary of Agriculture under President Jimmy Carter. Also included are records concerning Bob Bergland's later work as president of Farmland-Eaton World Trade and the selection of Bob Bergland to be CEO of the National Rural Electric Cooperative Association (NRECA). A finding aid is available in the repository and online. Until Bob Bergland's death, quotation or publication beyond the fair use provisions of the copyright law requires written permission. Oral History: 1978, 28 pages (60 minutes of tape). An interview with Bob Bergland regarding his tenure as a congressman and Secretary of Agriculture. Ralph Nader Congress Project. Citizens Look at Congress: Bob Bergland, Democratic Representative from Minnesota. Washington, D. C.: Grossman Publishers, 1972. United States. Congress. Senate. Committee on Agriculture and Forestry. Nomination of Hon. Bob Bergland to be Secretary of Agriculture: Hearing before the Committee on Agriculture and Forestry, United States Senate, Ninety-fifth Congress, first session ... January 11, 1977. Washington: Government Printing Office, 1977.